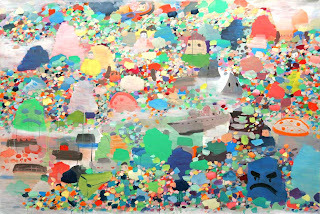 I LOVE the colours in this Jia Jia Wang piece. It's called 'Home, Home Again' oil on canvas. It will be shown at Alexandre Pollazzon on Howland Street 13 November - 20 December 2008, opening with a private view 6-8pm on Wednesday 12 November 2008.